A tall piece of heavy machinery travelling through Pattaya plunged a Nongprue neighborhood into darkness when it snagged power lines and pulled down an electric pole. Suntorn Saengthong of Tawornboon Engineering Co. was corralled by residents on Soi Mabtato 2 Jan. 23 after he rolled through their neighborhood around 8 p.m. with a JCB carrier (hydraulic lifting arm) too tall for the local wiring. 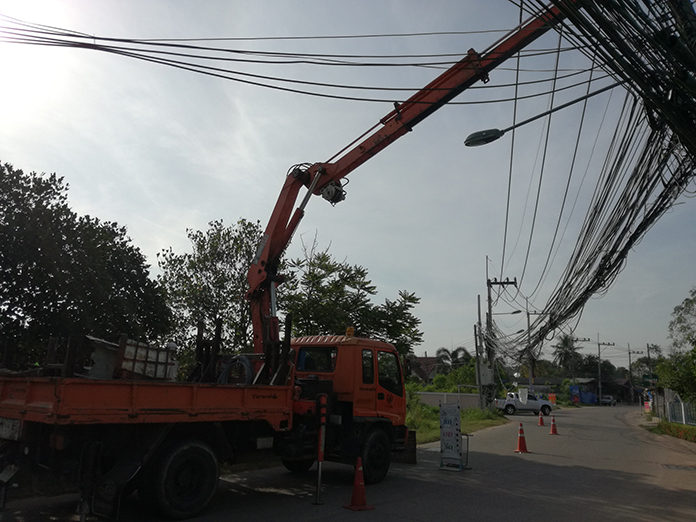 A tall piece of heavy machinery travelling through Pattaya plunged Soi Mabtato 2 into darkness when it snagged power lines and pulled down an electric pole. Suntorn admitted he was careless and didn’t consider the height of the hydraulic arm on the bed of his 10-wheeled truck. He said he’d pay for the damage, but added he felt the wires were too low. Residents countered that his load was too tall. The Provincial Electricity Authority fixed the utility poles by the morning, although telephone and cable television lines took longer to repair.